The Monday morning scene inside the glossy headquarters of the Moody’s Corporation at 7 World Trade Center was pretty typical: Men and women sporting dark suits and skirts huddled around laptops in a conference room, their backs to the windows filled with skyscraper views. They talked intently in hushed tones about the high-stakes presentations they were about to give. But these weren’t executives. They were whip-smart teenagers who’d traveled to New York — many for the first time — to compete in a national mathematics competition sponsored by the philanthropic arm of Moody’s, the international credit-rating behemoth, and organized by the Philadelphia, Pennsylvania-based Society for Industrial and Applied Mathematics (SIAM). This year, the Moody’s Mega Math (M3) Challenge drew 5,000 student entrants on 1,100 teams from throughout the U.S. Nearly 250 judges winnowed submissions down to six finalist teams, and those 29 students presented their work to a panel of professional mathematicians at Moody’s headquarters this spring. Their task: Use mathematical modeling to examine how and where car-sharing services like Zipcar and self-driving vehicles can succeed in the rapidly changing U.S. auto industry. The students completed most of their work during one intense 14-hour stretch in February. Moody’s schedules a weekend to release the problem online — which no one has seen beforehand — and students are responsible for working together from start to finish during the designated time period. Once they log on and the clock starts ticking, they have 14 hours to analyze the questions, conduct research, gather data, determine a solution and write a 20-page paper explaining their results. They’re free to use publicly available resources, but they can’t seek help from their coach or anyone else. Students gathered in living rooms and school computer labs and fortified themselves with pizza and snacks. Most finalist teams took the full 14 hours for the project and raced to hit the “submit” button just minutes before the deadline, they said. Once the finalists were announced and arrived in New York, their challenge at Moody’s headquarters was to convince the judges that their team had devised the most sound mathematical solution to this year’s problem and keep them engaged during a 15-minute presentation. Solving the real-world problem required critical thinking and technical skills from multiple classes, like calculus, algebra and statistics, students said. Alexander Ju, a senior at Governor Livingston High School in Berkeley Heights, New Jersey, said he enjoyed the rare opportunity to connect math to issues he might encounter in his own life. The competition awards $150,000 total, with $20,000 going to the winning team. In the end, first-time competitors from St. John’s School in Houston, Texas, coached by Dwight Raulston, took the top spot. The five-member team includes Nancy Cheng, Eric Gao, Daniel Shebib, Anirudh Suresh and Margaret Trautner. The Houstonites celebrated their win by ringing the New York Stock Exchange bell at the end of the day. “When we started we didn’t expect to get here necessarily, but we were really happy with what we did and thought it was a fun time,” Suresh told The 74, shortly after his team was declared the victor. 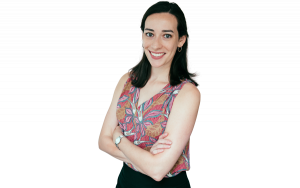 Amy Sanga, a technology specialist and math teacher at La Salle Academy, a Catholic college preparatory school in Providence, Rhode Island, said the learning experience has been “invaluable” for her students, who took one of the three finalist spots and won $5,000. La Salle Academy offers several courses that include applied mathematics concepts, Sanga said, but that’s more of an exception than a rule in U.S. high schools. In many other districts, students join math clubs or form private groups outside of school if they’re interested in advancing their math game. “This evolution of applied mathematics is starting to find its way into schools,” Sanga said. And as students continue bringing back lessons from competitions like the Mega Math Challenge, schools may be pushed to expand their offerings to include more formal applied mathematics curriculum, Sanga said. Raulston, the Houston team’s coach, said he’ll put some of the prize money toward entering students in future competitions. And he hopes the victory will bolster his case to St. John’s for infusing math modeling into the curriculum for ninth- and 10th-graders. “Mostly the kids don’t do much of this until junior or senior year … and so just the opportunity to get more modeling in the curriculum at an early age I think will be both enjoyable for them and help build some skills,” he said. 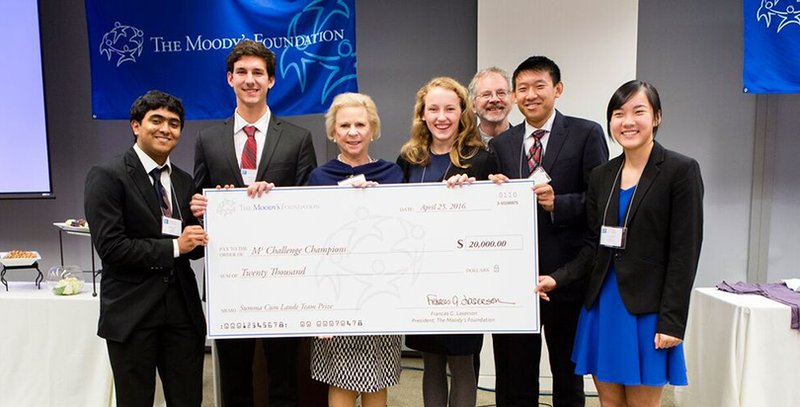 Lead photo: The Moody’s Foundation President Fran Laserson (third from left) presents a $20,000 college scholarship to 2016 Moody’s Mega Math (M3) Challenge champions, from left: Anirudh Suresh, Daniel Shebib, Margaret Trautner, Eric Gao and Nancy Cheng of St. John’s School, located in Houston, Texas. The team’s coach, Dwight Raulston, is pictured in back.